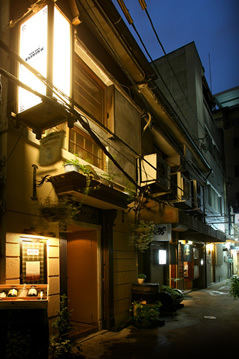 Osaka Kita Shinchi "The Bar Elixir K"
Elixir K is a wooden-decorated little hideout in the famous Osaka nightlife district Kita Shinchi. Elixir K specializes in numerous types of spirits and cocktails such as herb-infused Bloody Marys and Irish Coffees made from Artisian coffee beans. What makes Elikir K so special is the secret room upstairs which includes a see-through, walk-in cellar where many kinds of special, world-wide wines and whiskeys can be viewed. The room also includes antique, British style furniture and ornaments. The drinks at Elixir K are bought from various wineries and distilleries yearly from all over the world so all kinds of rare drinks can be found at the bar. 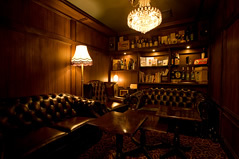 Please come and experience a relaxing night out in Osaka and meet the friendly, English-speaking staff who will provide you with some of the most delicious cocktails you will ever try. Copyright © 2010 THE BAR ELIXIR-K. All Rights Reserved.